Enjoy TV game show trivia fun at home. The Jeopardy board game captures all the fun of the number one trivia television game show - except the host, Alex Trebek! This is challenging fun for 3 to 5 players, ages 12 and up. Jeopardy is America's original television trivia game. The idea for the Jeopardy game came as a reaction to the late 1950's game show scandals where producers were accused of giving the contestants the answers to the game show questions. Merv Griffin, the television producer and talk show personality, had the idea to reverse the current "ask a question, give an answer" format. His idea was to give the contestant the answer, and ask them to determine the question. The original title for the pilot was What's the Question? 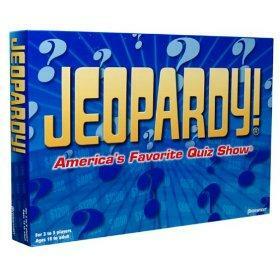 The show first aired in 1964 on NBC with Art Fleming as the host and was renamed Jeopardy. The name was chosen because the contestant could win or lose money with each question, so their money was always in "jeopardy." The show ran through 1975 but was replaced by a new game show, Wheel of Fortune. Jeopardy returned to the air in 1978 for one season with a revised version of the show. The second round was no longer played by all three contestants; instead, it was only played by the top two scorers from the first round. The final round was played by the winner of the second round and consisted of five questions which were selected by the contestant to form a horizontal, vertical or diagonal line on the game board. The current Jeopardy format came to CBS in 1984 and remains in syndication with Alex Trebek as the host. Jeopardy ranks as one of the top-rated syndicated shows. The Jeopardy television show was an immediate success when it aired in 1964 and was duplicated in a Jeopardy board game by Milton Bradley. Milton Bradley continued to publish the game into the 1980s, publishing fourteen new editions incorporating questions and answers taken from the television show throughout the years. Pressman Toys started publishing the game in the mid 1980s and published Electric Jeopardy in 1987, an early electronic version. Pressman re-released the Jeopardy game in the early 2000s and published Jeopardy - Simpsons Edition in 2003 to incorporate the graphics of the Simpsons characters with the Jeopardy game format. Jeopardy! Remote - published in 2003 by Tiger Games. This version of the game has the added feature of a wireless remote for the player to signal when they have a question to the answer. Jeopardy is a very easy game to play for both teens and adults. Players who enjoy trivia games like Trivial Pursuit will enjoy being able to select from the wide range of trivia categories. Players start by assembling the display board, adding the dollar-value cards and selecting someone to be the emcee and banker. The emcee completes the board set-up by sliding an answer sheet into the display board and placing a "Daily Double" sign under one of the answers.Each player rolls the die. The player with the highest number plays first. The first player selects a category and one of the dollar values. The emcee removes the value card from the display board so that everyone can see the answer on the board. The first player to signal with the clicker attempts to give the question that goes with the answer. If the player gives the correct question, he or she makes another selection of a category and dollar value. The player continues as long as they control the board. If the player gives the wrong question, the last correct questioner gets to make the selection of the category and dollar value. After 25 answers have been exposed, the display board is updated to double the dollar values for this round, called "Double Jeopardy." The emcee places two Daily Double signs on the board under two of the answers. The player with the least amount of money starts the questioning. After all of the answers have been exposed, Double Jeopardy is over the last round, "Final Jeopardy", begins for players who still have money. Players decide how much they want to risk. Each player gives a question for the final answer. Players with the correct question receive the amount of money they risked. Playing time is about 45 minutes. The winner is the player with the most money at the end of the game. Show off what you know by playing the Jeopardy board game with your friends and family!